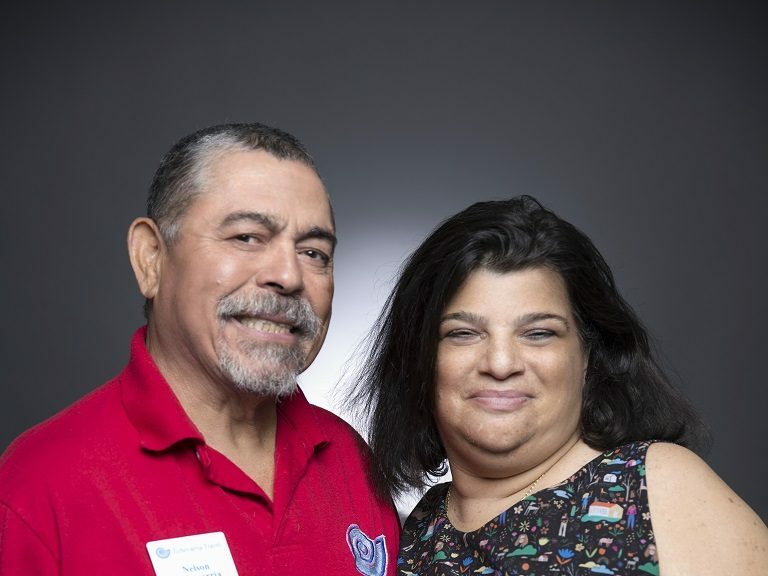 January 16, 2019 January 23, 2019 Cheryl EchevarriaLeave a Comment on Cheryl Echevarria Interviewed By Eye on Blindness Radio Show October 2018! Cheryl Echevarria Interviewed By Eye on Blindness Radio Show October 2018! Hello everyone! Sorry for the delay but I just received the audio of the show from November 2018. I was interviewed by Empish Thomas, host of Eye on Blindness Radio Show, produced by http://www.GAARS.org (Georgia Radio Reading Services). Hope you enjoy learning more about Echevarria Travel and why I went into the the travel industry. Empish: Hello everyone. This is Empish Thomas with another edition of Eye on Blindness sponsored by GaRRS. On this episode, we have Cheryl Echevarria. Thank you. I was trying to make sure I pronounced your name correctly. Coming onto the show. She has a travel business, and we’re going to be talking about travel this month. Cheryl, welcome to the show. Cheryl: Well, thank you, Empish. Nice to meet you and your listeners. Empish: Well, thank you so much, Cheryl, again for coming onto the show. Before we talk about your travel business, can you share a little bit about your life, your vision impairment and your education and your work history? Cheryl: Okay. My life up until I was 31, I was born in the Bronx, grew up on Long Island. I have a mother, father. I’m the oldest. It’s just me and my sister, so my sister’s up in Delaware. Married second time to my husband Nelson. We’d both been married before. I have one child from myself. I have three stepchildren, six grandchildren from my husband and two great grandchildren. Cheryl: My work history, I have been working since my father said, “Nothing comes to you free in this life.” People think because my dad was in management and upper management, things are handed to us on a silver platter. I was taught that if you want something, so I started out delivering newspapers. You say it was back in the day when kids did that. I worked around the house. I babysat during summer. I wanted to work in an office. My father let me work with his administrative assistant to learn what it’s like to work in office setting, also to learn just because somebody a CEO or president or somebody has a big title doesn’t mean you should be afraid of them. They earned that title. You respect it, but they’re a regular, everyday Joe. I learned how to do that. I was very big on education. I went to college. I went to Nassau Community College. Originally I wanted to become a culinary arts major. I wanted to be one of these famous Food Network chefs, but life changed a little bit. I met my first husband, got married. Life changed, so I went into administration. I became a legal secretary, became a medical biller. I always because this day and age, jobs are not as secure as they were, let’s say 40 years ago. You got a job, and you had that job until you retired. I worked in the banking industry. I have a lot of banking background. I have a lot of legal dealing with contracts, but most of all I am a lot in customer service. Working in banking, working with the different businesses that I have worked through, you have that one-on one feeling with the client. You learn empathy. You learn how to sympathize. You learn how to understand what the client is telling you versus the client needs this when they really don’t need that. You learn a lot. I lost my vision as an adult. I developed type-one diabetes when I was 13. They think I had it earlier than that, but going back almost 40-plus years ago, they really didn’t check children for what they call now juvenile diabetes or type-one where you need insulin. It was more of, at that time, still an adult disease and not a child disease. I found out I had it. At the age of 19 I started having eye issues. Then at 31, I became legally blind where I cannot see out of my left eye at all. Out of my right eye I could still see unclearly on certain days. When my blood sugar is stable, I can see clear than others. Empish: Turn your head, right. Cheryl: I use a cane. I have a guide dog who is retired, so I have used all blindness mobility skills. Cheryl: I do not read Braille, but I know what it is, so I know if somebody is looking for Braille. I know what it is, but I don’t. I know the basics, but I don’t read it. I hope that helps you to understand a little bit of who I am and where I’ve come from. Empish: Absolutely, absolutely. With all of that vast work experience, baking and legal and administrative and customer service and I think you said culinary. I lost track of all of your vast work experience. Cheryl: My big thing is my dream was that I love to bake. I love to cook. I like to. Even now with my vision and everything, I mark everything, and I know where everything is. When we lose our vision, and hopefully we’re working with the right people to get the right services that we need, I made sure that I learned how to use a knife again, to use the stove again. I took what my people up in New York had taught me and just improved on what was best for me and what didn’t work for me. I’m able to cook and bake and all that good stuff. I think that’s also why I became a travel agent because travel is not just getting from one place to another. It’s what you do when you get there, from the food, from the lifestyles to the history of a place. I’m sure I will go a little bit more into that in our conversation. Empish: Well, I think that’s a perfect segue because that’s what I was going to. My next question I was going to ask you is, what prompted you to get into the travel business and make this your next career move? One of the things I did was become an advocate with one of the blind organizations. I’m no longer with them because to me I think all the organizations are great, and I don’t want to be assigned to one any longer. I help everybody and not just one area. I had promised my daughter because at the time, I was sick. It’s not good to grow up with a parent who’s ill, so I said to her, “Where do you want to go? It’s your trip.” We’re planning a trip to Walt Disney World. I started out being very old-fashioned, contacting travel professionals because I know they’re the first ones to know about this. Cheryl: Being in all those jobs, I was like the travel agent myself because I had to call up travel agents for my sales team or my boss to say, “Hey, they want to do this. They want to do that,” whether it was for sales or it was for their personal travel. We use the administrative assistant that does everything, so I became the office travel agent, so to say, in contacting all the travel agents out there. You find out who knows what and who doesn’t. Back then, which was 2008, I’ve been in business 10 years on October 11th of this year. You find that there are a lot of travel agents that either do not want to touch the disability industry, that don’t know what they’re talking about. I would get, “Why do you want to travel to Walt Disney World? You can’t see anything,” or “Walt Disney World doesn’t have services for blind people,” or this and that. It really got me angry. There are so many things you have to know and understand and do things ethically and all that kind of stuff and be passionate about what you’re doing that you want to do this not just for a blind person but for anybody who wants to travel. That being said, I reached out to the blind organization I was with. They said, “Hey, are there any blind travel agents out there?” I think you know the gentleman that I’m going to mention was from Georgia. He had passed away, as we know, Mr. Morris Shackleford was a very close friend of mine. He was a travel professional. Cheryl: Not too many people knew that as we did, you know what? A very good travel agent he was in the business. It’s not still to this day. There are very few of us who are blind. There are other disabilities out there, and it’s a very growing field for people with disabilities because I know about blindness. I may not know about somebody with CP or somebody that’s permanently in a wheelchair. Empish: Right, or maybe someone who’s deaf or something. Cheryl: Exactly. A lot of people think, and I don’t mean to cut you off, Empish, but a lot of people think that travel agents are each other’s enemies. That’s a myth as well. In fact, travel agents, the reason why people don’t know we’re out there or don’t like to work with us anymore is there are so many myths out there about working with one. We do work with each other because we don’t know everything. I know the Caribbean. I know the United States. I know Europe, but I don’t know everything. If there’s something out there that I need or I want to partner with another agent to do a group or they want to learn more about traveling somebody with a visual impairment or a service animal. They’ll reach out to me because they know I do that. Instead of losing the client, they’ll either pass me the client or I give them the information that they need so we don’t. Even though we’re in the same field, and it goes back to being ethical again. We don’t steal each other’s clients. We actually help each other out should somebody need that service or information that the other person doesn’t. Empish: Well, that’s excellent. I didn’t realize that that goes on in the travel industry, but now that you’ve explained it, that does make a lot of sense. I’m sure that’s one challenge, but are there any other challenges that you deal with as you navigate with your travel business? Cheryl: There are still a lot of myths out there. People understand. When I call up and I say I have a client who is blind, and the first answer’s out of their mouth, “Well, I don’t have a wheelchair-accessible room for them.” I try to say it laughingly not to sound rude to the person on the other end of the phone because you don’t want to throw out. You want to play nice with your tour operators because they’re the ones that take care of you and your clients. Cheryl: It’s that kind of thing. People think until they meet you. That’s why I say people really have to get out there if they want things to be done and not sit in your home. I know that’s not easy. It’s easy to say and not easy to do because that’s a different conversation altogether. At the same time, in some instances it’s still difficult for me because some websites are still not compliant. They’re getting better at it. I know that laws were passed that websites have to be up to date. Pictures have to be captioned. Being a business owner, I am hosted by a very large travel host agency, which 90 percent of travel agents do. I’ll get into that a little later. Their websites, they teach their agents that, “Hey, you have to update your website. You have to put this and this and this and make sure because if you’re using one of our dedicated websites, they have to be ADA compliant. If you’re not using one of our websites that they supply for us and you don’t make it ADA compliant, that it goes against our corporate,” because they don’t want to be sued by somebody like yourself or somebody like me going through somebody’s website and they can’t access what’s on the pages. Cheryl: Here in the U.S. it’s not a problem, but some of the tour operators still don’t get it. There’ll be times where I have to call in to them to do a booking where I could do it online, that kind of thing. Other than that, I think the industry is really slowly but surely they’re getting there. I think it’s a good thing. Cheryl: Well, I would say first of all, I want to get the gorilla off the back. Your travel agents nowadays do not book individual airline tickets. If they are, they’re through places like Liberty Travel, huge travel conglomerates. I’m a small business owner, and 85 percent of travel agents out there are like myself, working from home, go to the clients, have online presence, but we’re not online booking engines. For us, if somebody is blind and looking just for airline tickets, we have to charge you a ticketing fee. It is nothing against you being blind or being disabled or whatever. It is because the airline industry for over 25-plus years has forced us to charge the client a ticketing fee because we don’t make any money on airline tickets anymore, nothing, absolutely nothing. If you’ve got to go to Jet Blue and you’re saying to me, “Well, why is your ticket $25 more than what Jet Blue is offering?” That is my service fee for helping you book your ticket. In the same instance, if you’re booking a cruise and we book your air fares through the cruise line, that $25 or $30 or $100 if you’re going international, that is our charge to you. Going back to your original question, many of the airlines now, and I’m not going to say all of them, are becoming compliant. If they are not, they do have compliant offices especially with ADA and everything else that you can call up, or you could call me and get that number. I don’t know all of them, but I can go online and get you that number. Cheryl: I’m not going to call the airlines for you, but I would say if you’re having difficulty booking an airline ticket on that airline’s website, that you call them directly. They’re not supposed to charge you a ticketing fee because you’re calling them directly because that’s against the ADA. Empish: Right, that makes sense. Empish: That makes sense. Well, Cheryl, this has been a fabulous conversation, but we’ve got to wrap it up. I know there’s so much more to talk about when it comes to travel and getting around and getting out and that kind of a thing, but this has been a great conversation. Just one last question before we leave. We want to get your contact information as well. Future plans for your travel business, do you have any future plans or things or goals or objectives you want to meet for your business? Cheryl: In general just keep doing what I’ve been doing. I love what I do. I’m very passionate about it. We do a lot of group travel, so our thing is to get information out there to everybody about what we do. We have newsletters. We have social media. The most important thing is face-to-face or on the phone like you. Cheryl: We’re not an online booking engine, but we do have social media presence. I’m going to give you my contact information. I’m going to spell my name because it’s long and people will mess it up. It’s Cheryl Echevarria. Cheryl’s spelled C-H-E-R-Y-L. Echevarria is E-C-H-E-V as in Victor, A-R-R-I-A. The name of my business is Echevarria, same thing as my last name, Travel. We put that both together with dot com. You go to our website, and we have a great ‘contact us’ page. Please contact us. Set up an appointment. It’s very important to do that because I’m very involved in the community as well. We’re out there. I have set hours for appointments. I’m open 10 to 7 p.m. Monday through Friday. Saturday’s 9 to 1, but again, I’m with the Chamber of Commerce. I’m with BNI. I’m very involved in our community, so that’s another thing. Phone number, 407-910-6469. That is not a text. That is my landline number. Please use that number. Email reservations, R-E-S-E-R-V as in victor, A-T-I-O-N-S@echevarriatravel.com. We’re on Instagram, Twitter and Facebook. Reach out to us. If you’d like an e-newsletter of events that we’re doing or want to join us on a group travel or start planning your own vacation, please let us know. We do U.S., Caribbean, Europe, Africa and Asia. Empish: Excellent, Cheryl. Thank you so much again for coming on the show. [Music starts] Thank you for sharing about your travel business, Echevarria Travel. We wish you great success in your future endeavor. Cheryl: Thank you for having me. You have a great day.